These are from the days when i used to play Minecraft, i programmed these for my own server particularly but since have released them to the public. Here you should be able to find all the information you need. 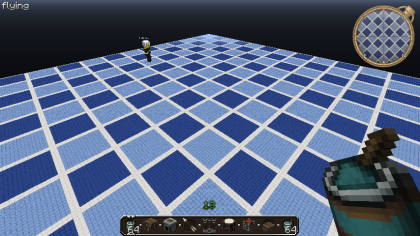 Hello this is a flatlands generator, best used with multiverse and works with CraftBukkit 1.3.2-R01 this project is designed to create a world that allows you to map out and plan you builds. The aim of this plugin is to be simple and user friendly. Customisable height and block types. World sizes are not restricted. Supports arbitrary height worlds, max height of 127 blocks only at the moment. Supports data values of block ids by use of ‘:’ between them ie. ‘wool:8’. Numeric IDs only. Able to generate a world of one particular item, if one Block ID is supplied. Added ability to accept only height as an option. Uses default Block ID’s. Alternating Borders when 3 Block ID’s are supplied. FlatlandsBuilder has dropped all support for Java 6 users and is now completely Java 7 dependent so please ensure you are running Java 7 on your server. flatlandsbuilder.edit – /flbd commands. (Will change to “flatlandsbuilder.edit.defaults” in next update, so expect a change). flatlandsbuilder.wizard – Command Wizard, /flbw Commands. Add the ability to generate a whole world of one particular item, if one item id is supplied. New command based wizard for configuring worlds. FlatlandsBuilder will become fully dependant on Multiverse-Core, wont be able to run with out it. Add command to FlatlandsBuilder to generate world. New configuration standard defaults, and world specific. Implement API to take the old way of configuring FlatlandsBuilder to the new config based system. Once this is achieved this plugin will be complete. This is another Plugin from the DKE Development Team, MaintenceMode is a simple light weight plugin that allows you to put your server into maintenance mode kicking all players that are not on the Admin list and also provides a message to players trying to logon to the server. Set custom message for when players try to logon. Can change the message so it suits the situation and day of maintenance. Kicks all players except admins listed in the config when MaintenanceMode is enabled. Can be used on both whitelisted and non-whitelisted servers. Servers Status Images which can be used on signatures in forums. Able to configure multiple maintenance modes. Clean whitelist if players have been on for a year for example. Optimze world, remove server intensive entities. /mmstatus - Shows the current MaintenanceMode Status. /mmedit mode <mode> - Selects the mode you wish to edit. /mmedit kick <true/false> - Sets kickOnEnabled for the selected mode. /mmedit kickmsg <message> - Sets kickMessage for the selected mode. /mmedit message <message> - Sets message for the selected mode. /mmedit motd <message> - Sets motd for the selected mode. /mm optimize world - Displays a world list. /mm optimize world <world> - Optimizes the selected world. /mm optimize whitelist - Removes players who haven't logged on for 30 days. /mm optimize whitelist <days> - Removes players who haven't played on the server for the selected amount of days. /mm reload - Reloads the plugin configuration. /mm version - Shows current plugin version. /mm sysinfo - Shows some useful system information. Add color codes to messages. Add count down (if required) till server lockdown, when kickOnEnable is true. Add a schedule system so a date can be set when the server is to be closed for maintenance. Add a command so players can check when the next scheduled maintenance is to occur. No known bugs in version 0.3.0 as of yet. This Plugin is a personalized Help pages plugin, i hope to add more functionality to it than other currently have. The plugin was designed to be more flexible easier to use and configure, for example simple color codes and grouping pages together into books (permission groups) so only one permission string has to be entered into the permission system rank/group. Even at the early stages of development this plugin was flexible enough to do what most other plugins can do. Codes or tags can be used to insert information from server. Informationcenter has dropped all support for Java 6 users and is now completely Java 7 dependent so please ensure you are running Java 7 on your server. Add and remove pages in game. Added command /listhelp, /listhelp [pageNumber] to view avaliable help pages. Added configurable Invalid Page Message (configured in the plugin config). Added configurable No Pages Message, for when using /listhelp command (configured in the plugin config). Added %%time% tag so you can add server time. Added DKE UpdateChecker, you can enable or disable in config (disabled by default).